Mumbai, 16 January, 2019: Stirred by the success in 2018, ŠKODA AUTO India introduces the 2019 SUPERB Corporate Edition at an attractive introductory ex-showroom price of INR 23.99 lacs exclusively for ŠKODA customers. The SUPERB Corporate Edition serves to cater a demand for a modern emotionally-rich design, a high degree of functionality, generous proportions and dimensions, innovative safety solutions, superlative ownership experience, and unparalleled ‘value for money’ proposition. The Corporate Edition is equipped with the 1.8 TSI (MT) petrol engine from the SUPERB model range which produces an impressive 180 PS (132 kW) of power and a torque output of 320 Nm while delivering fuel efficiency of 14.64 kmpl. The demand for an AT iteration was identified among its customers, which ŠKODA AUTO is contemplating to introduce towards the later part of the year. The 2019 SUPERB Corporate Edition will be available in two colour options: Candy White and the all new Magnetic Brown, across all authorized ŠKODA dealership facilities in the country. The front view of the ŠKODA SUPERB Corporate Edition is characterized by a wide radiator grille, an elongated bonnet, wide headlights, and razor-sharp front fog lights. The perfectly balanced proportions, the large glass areas and headlamps sweeping around the sides lend the car’s profile an extraordinary visual presence and emotional appeal. The rear of the car depicts a skilful play of convex and concave forms. The dark brushed décor with the stone beige leather upholstery uses the dialect of elegance that reflects the glorious ŠKODA history and design language. At ŠKODA AUTO, safety is a priority and not an option. The standard safety equipment in the 2019 SUPERB Corporate Edition includes a wide array of features, such as eight air bags: dual front air bags, side airbags at front and rear, curtain airbags at front and rear, and five three-point seatbelts. 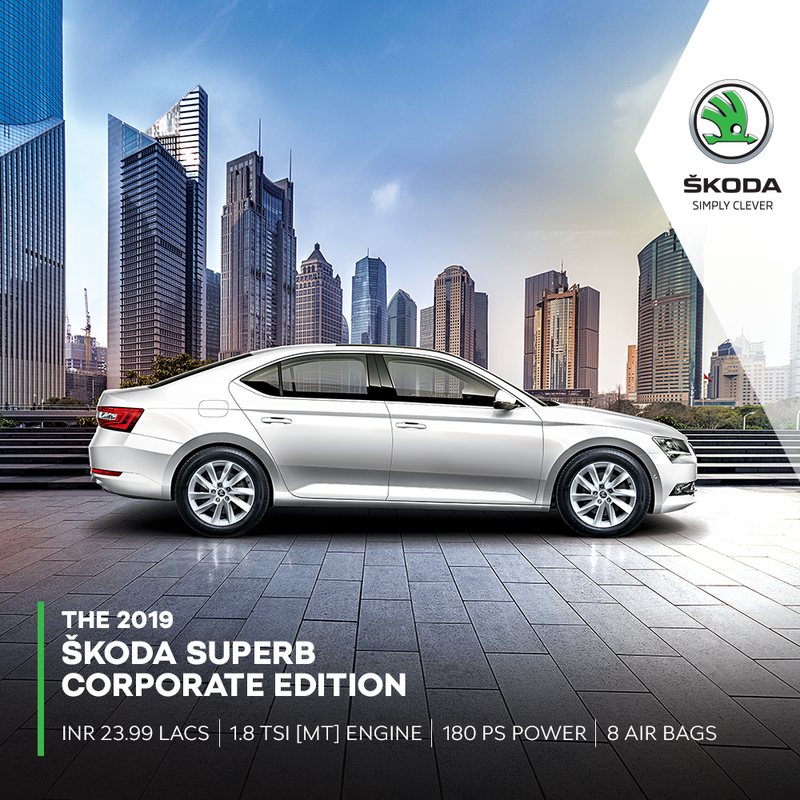 The 2019 ŠKODA SUPERB Corporate Edition hosts a plethora of the most technically advanced and intelligent connectivity features that add a practical twist to elegance. The state-of-the-art 20.32 cm floating touchscreen display with proximity sensor is a part of the new generation Amundsen infotainment system developed by ŠKODA. It is equipped with SmartLink™ technology (ŠKODA Connectivity bundles supporting MirrorLink®, Apple CarPlay, and Android Auto) which mirrors the smartphone for seamless connectivity and undistracted drive. New age ‘Simply Clever’ connectivity solutions along with BossConnect, integrated with ŠKODA Media Command App help occupants control functions like radio, music and navigation from the comfort of the rear seat.